The Meskwaki (also known as the Fox Indians) are an Algonkian tribe that relocated from Lower Michigan to east central Wisconsin in the early 1600s. They were one of many eastern tribes that migrated westward as a result of the disruptions of the eastern fur trade and the conflicts between the French and British colonies and their various Native American allies. By 1680 the Meskwaki had established several permanent villages in the middle Fox River Valley. Their grand village, which covered at least 45 acres, was located on high ground south of Big Lake Butte Des Morts. The Grand Village of the Meskwaki, identified by numerous historic French colonial documents, has been confirmed through extensive archaeological investigations at the bell site. 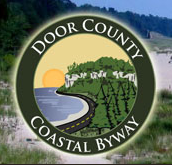 Another large Meskwaki village has been archaeologically documented on the south shore of Doty Island at the outlet of Lake Winnebago. A third village, located at Fahrney Point on the southwest shore of Lake Winnebago, has also been identified by historic documents and confirmed by limited archaeological investigation. 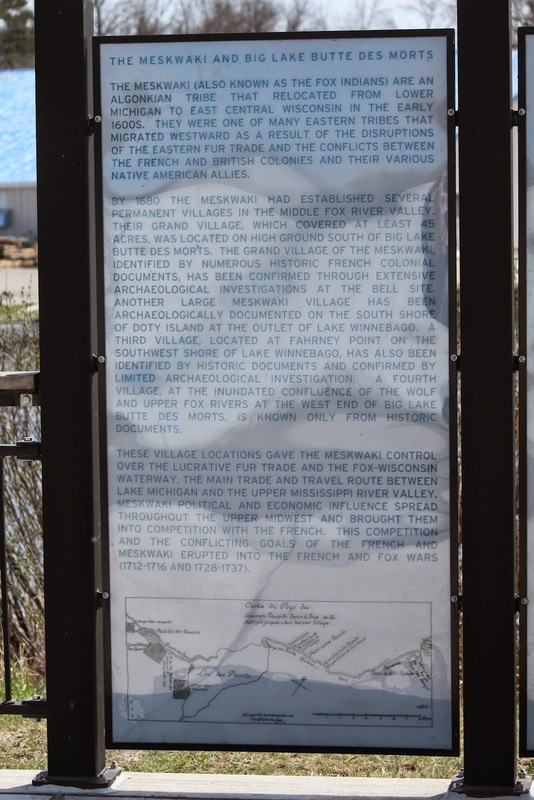 A fourth village, at the inundated confluence of the Wolf and upper Fox rivers at the west end of Big Lake Butte Des Morts, is known only from historic documents. The village locations gave the Meskwaki control over the lucrative fur trade and the Fox-Wisconsin Waterway, the main trade and travel route between Lake Michigan and the Upper Mississippi River Valley. Meskwaki political and economic influence spread throughout the upper midwest and brought them into competition with the French. This competition and the conflicting goals of the French and Meskwaki erupted into the French and Fox wars (1712-1716 and 1728-1737). In 1716, a force of nearly 800 French and their Native American allies attacked the Grand Village of the Meskwaki. After three days of siege, which included the use of artillery, the Meskwaki were forced to surrende. Archaeological investigation of the bell site (The Grand Village of the Meskwaki) has produced fragments of explosive mortar shells, confirming the identification of the site with the Meskwaki. Two more French expeditions (1728 and 1730) and intensified warfare between the Meskwaki and the Native American allies of the French forced the Meskwaki to permanently abandoned the Fox River Valley in 1730. The French genocidal policy resulted in several massacres and significantly decreased the Meskwaki population. After 1730, the Meskwaki relocated to the lower Wisconsin River Valley and the surrounding portions of southwestern Wisconsin. Following the establishment of American control of the territory, especially following the end of the war of 1812. The Meskwaki had largely migrated to Iowa, despite a forced relocation to Kansas, most of the Meskwaki returned to Iowa. The majority of the Meskwakis still reside in Iowa, on their settlement near Tama. 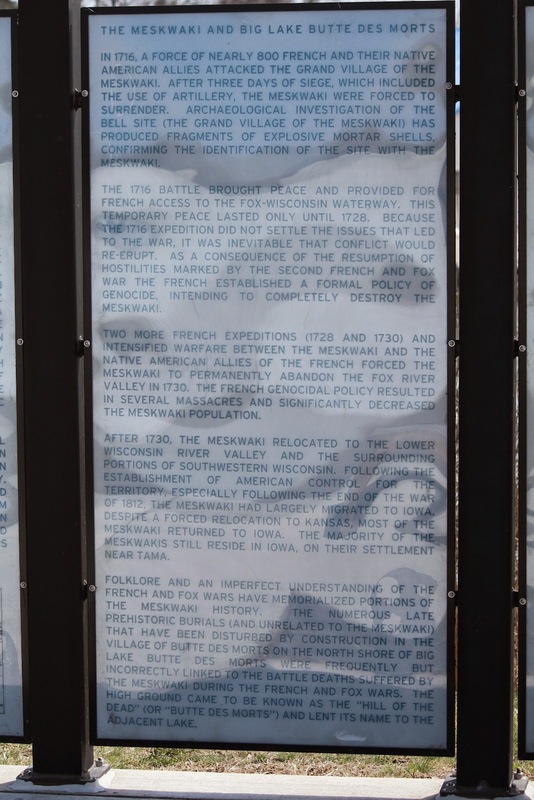 Folklore and an imperfect understanding of the French and Fox wars have memorialized portions of the Meskwaki history. The numerous late prehistoric burials (and [sic] unrelated to the Meskwaki) that have been disturbed by construction in the village of Butte des Morts on the north shore of Big Lake Butte Des Morts were frequently but incorrectly linked to the battle deaths suffered by the Meskwaki during the French and Fox wars. The high ground came to be known as the "Hill of the Dead" (or "Butte des Morts") and lent its name to the adjacent lake. A large prehistoric burial mound on the west shore of Little Lake Butte Des Morts, destroyed for railroad grade fill during the Civil War, was also widely known as the "Hill of the Dead" (or "Butte des Morts"). When many human burials, also totally unrelated to the Meskwaki, were encountered during the mound destruction, the popular interpretation was that they were casualties from one or more battles of the French and Fox wars. Despite their names, neither Hill of the Dead is connected to the Meskwaki or the French. Winneconne was the name given to the high ground between Lake Winneconne and the west end of Big Lake Butte Des Morts on either side of the Wolf River by the Menominee. Winneconne translates as "Place of the Skulls." Menominee tradition links to the location to a battle between the Meskwaki and Menominee during the final stages of the French and Fox wars. The numerous Meskwaki dead were left on the ground and for many years the bones and skulls were visible to passersby. The specific date and the particulars of this battle are now known, nor were they reported by the French Colonial authorities. While the Meskwaki have long been gone from east-central Wisconsin, their climactic struggle with the French for control of the land has left their imprint on the cultural landscape of Wisconsin. The Fox River uses the British and American name for the Meskwaki. 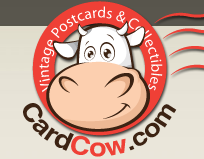 Outagamie County is also named for the Meskwaki, Outagamie is the Ottawa name for the Meskwaki. The entrance (I used) to the Tribal Heritage Crossing of the Wiouwash State Trailis located adjacent to the parking lot for Two Brothers Family Restaurant, located at 1930 Rath Lane, Oshkosh, Wisconsin 54904. The marker consists of three panels. These plaques are imbedded into the cement in front of the markers.